Each of our 3 suites is large, has high ceiling with private terrace and fireplace, ceiling fan, refrigerator, TV and wireless internet. Of course all our suites have ensuite, talavera - tiled bathrooms, king size beds and high quality linens. at 475 ft� including the lovely terrace that overlooks the pool. It is decorated in lively shades of orange & green. The bathroom is very spacious with a full tub, uncommon in Mexico. It is on the 2nd floor. is quite spacious at 400 ft�. 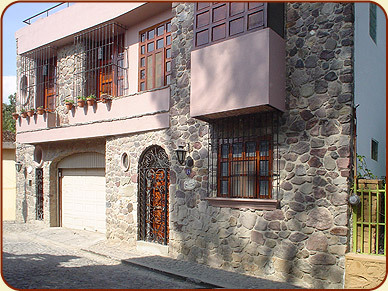 It has 2 small balconies overlooking the street and still another overlooking the interior courtyard. Decorated in rich royal blue and yellow it is a comfortable retreat after a day of sightseeing or shopping. It can be converted to 2 twin beds if requested. It is on the 2nd floor. or little house is in the rear of the property in the garden. It is our only ground floor suite. Including its large terrace, it is over 500 ft2. La Casita has a large walk in closet, dressing room and bathroom with shower, all decorated in shades or teal, rust and ivory. Room Rates: Our suites are $85.00 � 100.00 per night depending on the room and season. All prices include taxes and a full breakfast. Weekly and monthly rates are available. Our room rates are in U.S. dollars. We accept U.S. dollars or Pesos at the appropriate exchange rate. We do not accept credit cards or personal checks. Deposit: A 50% deposit or 3 days room rate (whichever is less) is required to secure your reservation. Payment can be made by check or Paypal. Further information will be provided when we confirm availability for your selected dates. Check in / Out: Guest check- in is at 3:00 pm. We are at the B&B from 3:00 pm to 6:00 pm daily. If you plan to arrive at another time, please let us know so we can arrange to be here to check you in. Check out time is noon. La Quinta del Sol is a smoke free environment and unfortunately we cannot accept pets.